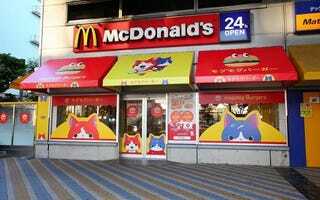 A McDonald's in Tokyo's Odaiba has been turned into the fictional fastfood joint Mogmog Burgers from the extremely popular video game and anime series Yokai Watch. As reported on Inside and AnimeAnime, the restaurant is a recreation of Mogmog Burgers, with the burgers actually served up in a special Mogmog box. The inside of the restaurant, including the tables, is covered in Yokai Watch. This shouldn't come as a surprise. Earlier this fall, Yokai Watch Happy Meals drew long lines across Japan.